The Department of Consumer Affairs (DCA) licenses sidewalk cafés. On this site, license applicants, Community Boards, and the general public can access important information. Learn about the three types of sidewalk cafés that DCA licenses. Learn what DCA inspectors check for at each type of café. Find existing sidewalk café locations near you and see the details about the café. Track new and renewal license applications. Learn when public hearings are scheduled for license applicants. Generate and easily export, in CSV format, a searchable list of sidewalk cafés located in a Community Board district. This map was developed by the City of New York and gives general information only. The City seeks to keep information up-to-date and accurate but cannot guarantee the completeness or accuracy of the information. The City disclaims any liability for errors that may be contained herein and shall not be responsible for any damages, consequential or actual, arising out of or in connection with the use of this information. The City makes no warranties, express or implied, including, but not limited to, implied warranties of merchantability and fitness for a particular purpose as to the quality, content, accuracy, or completeness of the information, text graphics, links, and other items contained in the map. To start or run your business, you may need more information about City, state, and federal laws. If you do not comply with all laws and rules, you may have to pay fines and you may lose your licenses or permits. This loss may be temporary (suspension) or permanent (revocation). You may be subject to other penalties allowed by law. This information is not legal advice. You can only obtain legal advice from a lawyer. Businesses can legally operate a sidewalk café if they hold a DCA license or a temporary operating letter. An enclosed area on the public sidewalk adjacent to restaurant that is constructed predominantly of light materials such as glass, plastic, or lightweight metal. An outdoor area on the public sidewalk adjacent to the restaurant that contains removable tables and chairs. An unenclosed sidewalk café containing no more than a single row of removable tables and chairs adjacent to the building. The tables and chairs can occupy no more than 4 feet, 6 inches of the public sidewalk. Cafés with a combined Small Unenclosed and Unenclosed Sidewalk Café license are usually located on corners at the intersection of separate sidewalk café zoning regulations. Part of the café is licensed as a Small Unenclosed Sidewalk Café, and a separate part of the café is licensed as an Unenclosed Sidewalk Café. Each part of the café must conform with the requirements for the café type. Sidewalk cafés with a status of “Inactive” cannot legally operate. Cafés that fall under this category include: new or renewal applicant whose license application is under review; business with a change in ownership (which requires new application review); business that withdrew an application; business whose application was denied; or business whose license expired. This map was developed by the City of New York and gives general information only. The City seeks to keep information up-to-date and accurate but cannot guarantee the completeness or accuracy of the information. The City disclaims any liability for errors that may be contained herein and shall not be responsible for any damages, consequential or actual, arising out of or in connection with the use of this information. The City makes no warranties, express or implied, including, but not limited to, implied warranties of merchantability and fitness for a particular purpose as to the quality, content, accuracy, or completeness of the information, text graphics, links, and other items contained in the map. Built using Bootstrap, code licensed under MIT. Use this checklist to learn what NYC Department of Consumer Affairs (DCA) inspectors look for and help avoid violations. Note:Businesses must comply with all relevant federal, state, and City laws and rules, which are available at nyc.gov/consumers . A valid DCA Sidewalk Café license is required to operate part of a restaurant on a public sidewalk (not on private property). DCA’s combined license and complaint sign must be posted where all customers can see it. All of the items in the sidewalk café (chairs, tables, planters, etc.) must be placed as they appear in the architectural plans submitted with the license application to DCA. It is illegal to have more tables or chairs than what is stated on the license or temporary operating letter. Tip: If two tables are pushed together but can be easily separated, they will be counted as two tables. If two tables are bolted together or held together in a way in which they cannot be easily separated, they will be counted as one table. For small unenclosed cafés, there cannot be a railing, structure, or other form of a barrier between the café and the sidewalk. For regular unenclosed cafés, the base wall, railing, planter, or fence being used must be self-supporting and removable. Tip: The barrier is not removable if it appears to be permanently affixed to the sidewalk, and it is not self-supporting if it is supported by the café’s tables or hung from the café’s awning. A regular unenclosed café cannot use a railing planter, base wall, or fence higher than 30 inches to separate the sidewalk café. Tip: To make sure you’re complying with the law, measure to the top of any plants. At least 8 feet or 50 percent (whichever is greater) of the sidewalk along the frontage of the sidewalk café must be clear and unobstructed. Tip: Measure the entire width of the sidewalk from the building to the nearest obstruction or curb line. If there is a large obstruction along the frontage of the sidewalk café, such as a bus shelter or subway entrance (except closed end), the Clear Path must be at least 15 feet between the café and the large obstruction. Tip: A large object is anything larger than 15 feet in area. If the sidewalk café is located on the corner, at least 9 feet from the corner must be clear and unobstructed. A small unenclosed café cannot have any overhead coverage other than a fixed awning that extends no farther than 3 feet or a retractable awning that extends no farther than 4 feet, 6 inches. The height of the awning must be at least 7 feet above the floor, measured from the lowest part of the awning or valance. (A “valance” is the part of an awning that hangs parallel to the wall.) The awning must be retractable if it extends beyond 3 feet. Objects inside the sidewalk café such as tables, windows, or potted plants cannot swing or project beyond its perimeter with the exception of fire doors used exclusively as emergency exits. No object—other than lighting fixtures and Heating, Ventilation, and Air Conditioning (HVAC) installations—may be permanently affixed to any portion of the sidewalk café wall. All sidewalk café furnishings, such as tables, chairs, and decorative accessories, must be moveable and cannot be affixed to the ground or the café. No objects, other than lighting fixtures and approved heaters, may be permanently affixed to the sidewalk café wall. The café floor cannot be covered by carpet, paint, grass, artificial turf, or any other surface cover. Heating units cannot be placed outside of the sidewalk café. For enclosed sidewalk cafés, if the roof is glass or another material other than fabric, a sign may be placed on the glass wall as long as the sign does not cover more than 50 percent of the glass. The lettering on a valance cannot be greater than 8 inches on a 12-inch valance and must be limited to a single horizontal line. All sidewalk cafés must provide access to persons with physical disabilities by having at least one door to enter that is 3 feet or wider. A non-skid ramp may be required if there is a change in grade. Tip: A non-skid surface is usually textured to prevent water buildup and includes concrete or a rubber mat. The café floor cannot be uneven with the adjoining sidewalk. The café cannot block any building exit. Garbage cannot be placed or stored on the public sidewalk. Musical instruments and speakers cannot be used in a sidewalk café. Tip: It is not a violation if music is being played inside the restaurant. If alcohol is served at the sidewalk café, a waiter or waitress must serve it to the patrons at the café. Floodlights cannot be used to light the café, and all lighting must be directed to the interior of the café. Service to customers can only be within the designated sidewalk café area. There must be a 36-inch service aisle for the entire length of the tables that is separate from the minimum 8-foot pedestrian (clear)path. Tip: For regular unenclosed cafés this aisle may be between rows of tables, but for small unenclosed café it must be on the outside of a single row. Tip: The service aisles cannot overlap with the pedestrian pathway. Therefore, for small unenclosed cafés, there must be at least an 8-foot pedestrian (clear) path and a 3-foot service aisle for a minimum of 11 feet total clearance. Customers cannot be charged extra for sitting in the sidewalk café, and food and drink must cost the same in the sidewalk café as inside the restaurant. If a menu is displayed in the sidewalk café, it cannot be larger than 3 square feet. If there is a minimum charge for dining in the restaurant or sidewalk café, it must be prominently stated on the sample menu and on each table menu. 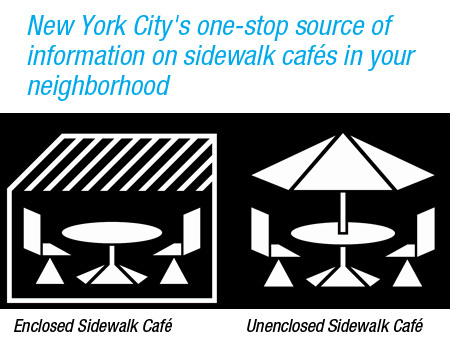 To learn more about NYC Sidewalk Café requirements, visit DCA’s license requirements page and download Inspection Checklist: Sidewalk Cafe (in PDF). Businesses must comply with all relevant federal, state, and City laws and rules. All laws and rules of the City of New York, including the Consumer Protection Law and Rules, are available at DCA’s key laws page . Before DCA can issue a Sidewalk Café License, the Application must be reviewed or approved by other parties. The number of days for each step in the approval process are general estimates. The approval process may take more time if there are modifications to the original application or additional information is needed. DCA reviews application materials and forwards application information to the relevant Borough President, CB, City Council Member, and Speaker of the Council. DCA will tentatively schedule a public hearing and provide details on public hearing posting requirements. DCA reviews application materials and forwards application information to relevant City Council Member, Speaker of the Council, DCP, DEP, and LPC. DCA will tentatively schedule a public hearing and provide details on public hearing posting requirements. Note: If you are applying to operate an existing enclosed sidewalk café that was previously licensed, DCA may issue a Temporary Operating Letter. NYC Department of City Planning (DCP) reviews information. If DCP has objections, the applicant must correct them within 6 months. If DCP approves the corrections, DCP forwards information to CB for review. CB may hold a public hearing to provide recommendations to DCA. Call your Community Board or click the link for more information about the Community Board process. DCA public hearings are held at 2:00pm on the 11th floor at 42 Broadway. If there are issues, DCA will notify applicant and applicant may request, in writing, up to 180 days to correct any issues. If there are no issues, DCA files a decision within 2-3 days of public hearing. City Council can call the application to a vote and, if called, the review may take up to 50 days. This proposed café is in . DCA forwards approved revocable consent to MOCS for signoff. DCA issues a Temporary Operating Letter, a consent fee bill, and the required complaint sign. DCA will then mail the license document and a copy of consent agreement. DCA issues permission to construct the enclosed sidewalk café and sends a consent fee bill. Applicant is responsible for securing work permits from DOB. Once construction is completed, DCA inspects the premises, and upon approval DCA issues a Temporary Operating Letter (if not already received), and the required complaint sign. DCA will mail your license document and a copy of consent agreement. DCA issues a Temporary Operating Letter (if not already received), a consent fee bill, and the required complaint sign. DCA will mail your license document and a copy of consent agreement. This step of the approval process is pending. The application has completed this step of the approval process. The application did not complete this step of the approval process. The application was withdrawn or denied. Provided by NYC Department of Consumer Affairs (DCA). The data set is for informational purposes only. Note: Filtered subsets of this data may be downloaded by selecting a Community District on the map and click View List on the lower right corner. Bootstrap is licensed under MIT License . Leaflet is licensed under BSD-2 . Leaflet.Sidebar-v2 is licensed under MIT License . Leaflet-omnivore is licensed under New BSD License . Overlapping Marker Spiderfier is licensed under MIT License . Proj4Leaflet is licensed under BSD-2 . Leaflet-search is licensed under MIT License . Leaflet-locate control is licensed under MIT License . JQuery is licensed under MIT License . JQuery DataTables and related plugins are licensed under MIT License . Café Regulations icons courtesy of Yi Seul Chun.